The monthly ArtSmart Roundtable brings together some of the best art-focused travel blogs to post on a common theme. This month we are finding Art that Inspires from our travels. Check out all the stories below! Art by itself is empty; it requires an audience to react, contemplate and interpret it for themselves. It is the skill of the artist that turns pigments on a board and chipped away marble into something that can elicit emotion or opinion from viewers. 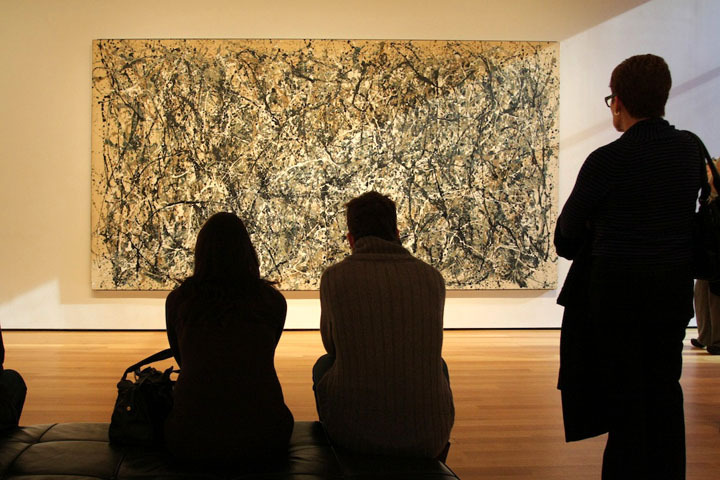 Every art connoisseur is different, so it is very common for us each to like different styles or pieces. I certainly have my favorites and not-so-favorites. This month the ArtSmart Roundtable is looking at “Inspiring Art” so I thought I’d take a look at not just art that is beautiful or emotional, but art that simply astounds me. On 26 November 1922, a team of British archaeologist first breached the door and peered into the tomb of King Tutankhamun. When the expedition’s financier Lord Carnarvon asked, “Can you see anything?”, Egyptologist Howard Carter uttered perhaps the most perfect response, “Yes, wonderful things.” I can only imagine what he saw by candlelight peaking through a hole in the wall! Even emptied out and displayed in a museum, the contents of an ancient Egyptian pharaonic tomb is one of the most incredible thing I have ever seen. A few years ago, a selection of artifacts from King Tutankhamun’s tomb were brought to the US. I made a special trip to Philadelphia to see the exhibit and even then went through the exhibit twice. The sheer number and diversity of pieces in the tomb was incredible: a chariot, statues, beds, boats, chairs, baskets, and countless models of servants and other goods. Plus, each item for the Pharaoh was made of the finest gems and gold and executed with the greatest of craftsmanship so each piece is simply gorgeous. I also love the design coherence of ancient Egyptian art. Whether furniture, wall paintings, jewelry or the sarcophagus itself, there is a strong style in each piece that connects and compliments each other without being repetitive or formulaic. The result is a collection of goods that is way more than the sum of its parts – which is incredible considering how much gold was used! If the purpose of architecture is to create a space that conveys an emotion, then I have seen a lot of really incredible architecture. While I love the order and weight of Romanesque buildings and the harmony of the Renaissance style, Gothic architecture is my favorite for tranquil, holy spaces. Thin ribbing, delicate arches and high ceiling express an airiness and peace that transcends the stone materials. While an engineering marvel, all the support structures are outside which focuses the interior on its soaring, heavenly design. Gothic churches are not just something to look at but rather something to experience. I love watching how the shifting daylight can change the appearance of the interior throughout the day. Even over the course of an hour long mass, shadows change and stained glass reflections will slide over the walls or floors. Of course the acoustics are incredible too. Everything from footsteps to musical performances take on a new resonance when there are Gothic walls to bounce across. 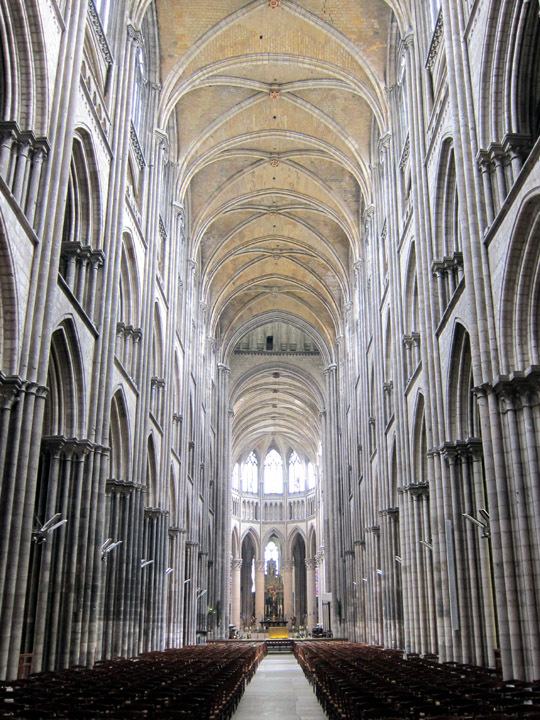 Any visit to a Gothic cathedral should include some time sitting and enjoying the immersive art experience. 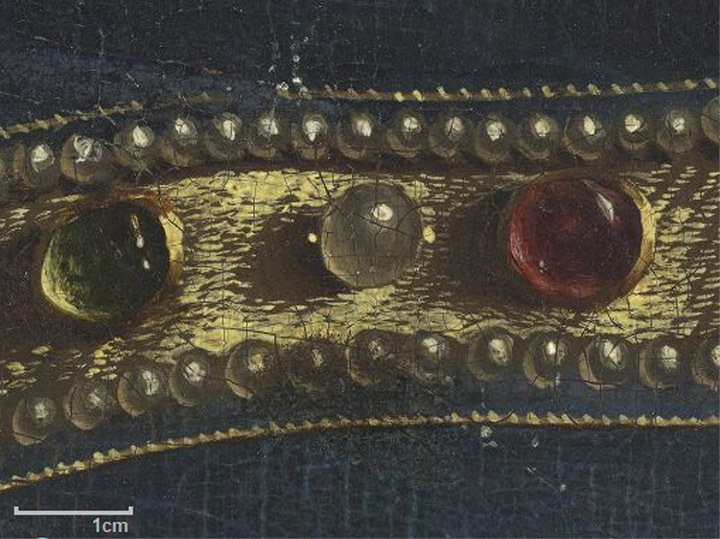 Detail of jewels from the “Ghent Altarpiece” by Jan van Eyck. Notice the scale bar of 1 cm and all the detail and shading in each small pearl. 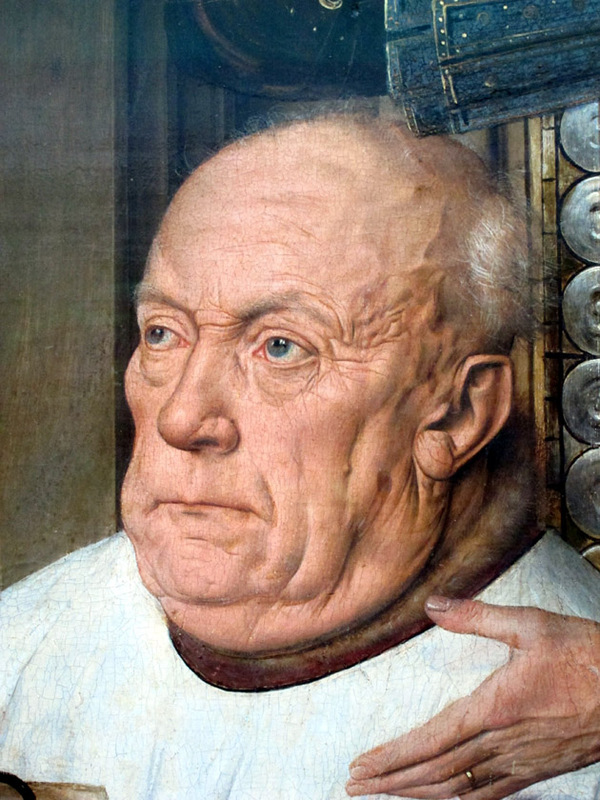 Maybe its because I can’t paint well, but I am astounded by miniature paintings. While I like modern art of the last two centuries which put brushwork front and center, there is something magical about a painter that can make his or her brushstrokes disappear. This requires incredible skill, patience and even single hair brushes, but the effect is a pure image with little trace of human involvement. One painting that was very shocking to see in person was Sandro Botticelli’s “Calumny of Apelles”. In this complex allegorical scene, Ptolemy is judging Appelles in the presence of personifications of Calumny, Malice, Fraud, Envy, Remorse and Truth. Done in tempera which is a very difficult medium to work with already, this very detailed painting with elaborate architectural panels is only 24 inches by 36 inches. By comparison, Botticelli’s other allegorical images are huge: “Pallas and the Centaur” is 81 x 57 inches, “The Birth of Venus” is 67 x 110 and “Primavera” is an astounding 80 x 124 inches. To me, “Calumny of Apelles” looked like a shrunken Botticelli painting but with all the visual integrity and captivating color of his larger works. Especially popular as Grand Tour souvenirs, Italian micromosaics feature flowers, animals or, most impressively, detailed depictions of monuments and landscapes. The smallest pieces were made into broaches or other jewelry. The “bigger” ones were made into snuff box lids or were freestanding pieces. I saw one micromosaic at auction a few years ago that was absolutely incredible. For something only 8 inches by 10 inches, there was depth and light in the scene and really no perceivable gaps where the blocks met. It was just a marvelous piece of craftsmanship and definitely looked like a painting at first glance! There are some works of art that I find impressive even though I haven’t seen them in person yet. Someday I hope to visit the Terracotta Warriors of Xi’an, China. First discovered in 1974, excavations have yielded 3 massive pits filled with 8000 pottery soldiers, horses and chariots. Each figure is about six feet tall, 600+ lbs and had a highly detailed costume differentiating unique classes of soldiers, archers and generals. The scale of the project but also the individuality of each figure is just amazing to me. The soldiers were originally painted, but as soon as they are unearthed the sensitive lacquer layers immediately begin to degrade leaving behind the bare terracotta statues we are so familiar with now. The execution of 8,000+ life-like and unique brightly painted soldiers with their horses in an incredible accomplishment and an awesome work of art. There are also times when something I didn’t expect to be moving actually blew me away. Some works of art have a presence that you can only appreciate in person. Jan van Eyck’s The Madonna and Child with Canon van der Paele at the Groeningemuseum in Bruges was one of those pieces. From the naturalistic details in the faces to the luminous colors, I just kept getting pulled back to the piece. (More on that here.) Byzantine style art in situ also seems to have that effect on me too, whether in Greece or Cana, Israel. So what works of art have inspired awe for you? Erin of A Sense of Place – coming soon! Ashley of No Onions Extra Pickles – coming soon! Wonderfully, marvelously put. I think this is just what i needed to start being inspired by art again! 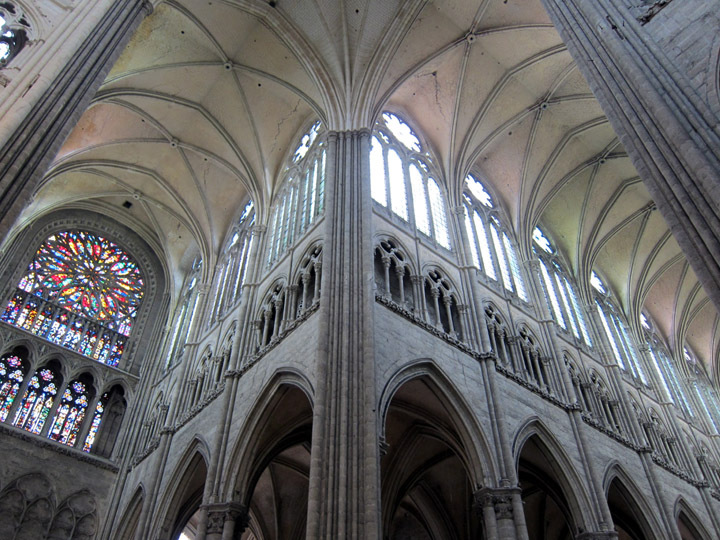 The Gothic cathedrals are what made me want to start art history. I was 12 or 13 when I fell in love with Amiens. I think i need a quick jaunt over to France right now to get that moment back. Absolutely amazing journey I have just traveled with you in your article! From the tombs of Egypt to the soaring vaulted arches of Gothic cathedrals, I can see how every one of these exhibits inspired you along your journeys of discovery because I share many of your passions as you know. I am still reeling from your paragraph above about imagining what it must have been like to peer inside Tutankhamun’s tomb! Wow!! Thank you for this journey of discovering art around the world! As a child, I was fascinated by Egyptian artifacts at the museum and pondered what made an Ellsworth Kelly art. High school introduced me to medieval architecture (I had to build a model of Monte Cassino), and I’ll never forget what it felt like to see Sainte-Chapelle in person. Great post! Much like you and Erin I found myself engulfed in the mythology of Egyptians and especially Greek & Roman myths. I feel that way when I see those tiny detailed wood carvings in what look like pocket watches – I can’t remember what they are called but they are astounding much like tiny paintings. I think the most profound moment thought was when I walked into the Sala dei Giganti of the Palazzo del Te in Mantua, Italy. I’ve written about it before and feel like I could all again. I would have to agree with those comments above…this is a great post that any lover of art history can relate to, I’m sure. 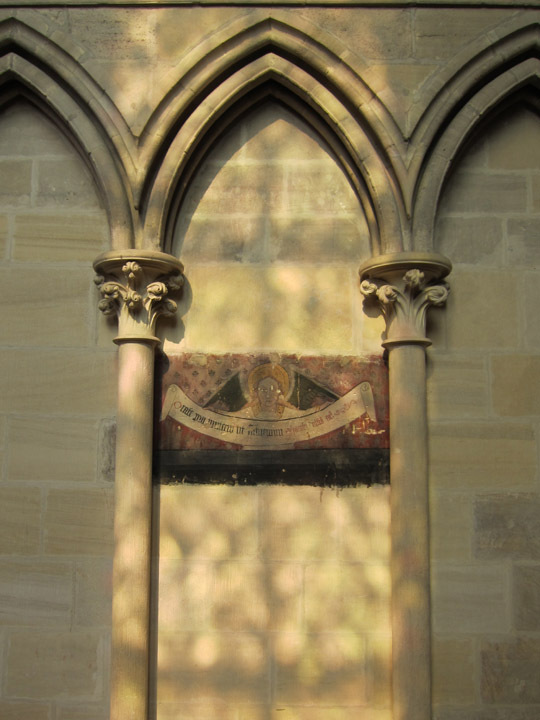 I too found wonder in ancient art and Gothic cathedrals. It’s inspiring to think about what humans could accomplish. I’d love to see some of that art and those places again soon. I saw the Tut show here in Toronto. It really was like stepping into the tomb with Howard Carter. Architecture and art have affected and added so much to my life, it’s inestimable. Absolutely! It has got to be so astounding to see them all lined up and at attention after all that time underground. I’m sure the traveling exhibit was good, but I still hope you get to see them (for real) someday!